Entrepreneurs, project managers and engineers know the importance of time-to-market for a successful product launch. No matter where a manufactured part or product is headed, it’s critical to maximize the speed and efficiency of its production. Lean manufacturing is synonymous with this goal. But beyond kaizen, kanban and a whole glossary of other Japanese terms, what real steps can manufacturers take to support lean manufacturing? Using digitalization, automation and lean principles, Protolabs has successfully implemented fast and efficient digital manufacturing within their facilities. In this report, readers will learn about how Protolabs achieved this goal and how using manufacturing services such as Protolabs can also support lean practices in your manufacturing operations. The technology and strategies used in Protolabs’ advanced digital manufacturing facilities. How digital manufacturing services can save time and cost. How digital means leaner, and leaner means faster. How lean manufacturing principles support faster, more efficient processes in design, prototyping and production. 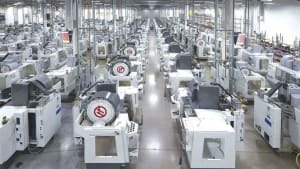 What “digital manufacturing” really means, its benefits, and how it was implemented at Protolabs. How to evaluate the options for in-house and contract manufacturing, including via web-based digital services or overseas suppliers. Fill out the form on this page to download your report. This research report has been sponsored by Protolabs.